The two games this year mark Ichiro's 28th season as a top tier professional baseball player in the United States and Japan. "I have achieved so many of my dreams in baseball, both in my career in Japan and, since 2001, in Major League Baseball," Ichiro said. "I am honored to end my big league career where it started, with Seattle, and think it is fitting that my last games as a professional were played in my home country of Japan." The 10-times All Star also set MLB's record for hits in a single season with 262 in 2004, but he remained humble to the end. "I do not know well whether it is success, I can not judge that at all. So I hate the word success," Ichiro told reporters. "I think that it takes great courage to go and try challenge in the MLB," he continued, directing his message to young aspiring Japanese players. "If you want to do it, you should challenge. There will be no regrets no matter what the outcome. Basically, you should go for what you want to do." He is expected to continue to work with the Mariners, having started a new role as "special assistant to the chairman" last year. 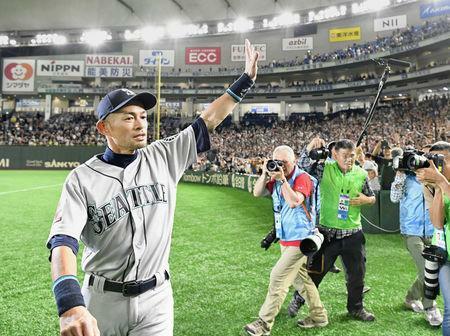 Ichiro was given a hero's send-off in a packed Tokyo Dome at the end of his final game and his team mates met him outside the dugout to pay tribute. Kikuchi, who moved to the MLB before this season, bowed to Ichiro before weeping as he buried his face in the 45-year-old's shoulder. "I don’t think it is an understatement to say that Ichiro has had a bigger impact on the way Americans view Japan that really any other single person," Jim Small, the MLB international vice-president, told Reuters before Ichiro's announcement. "I think that what he has done since 2001, to become arguably the greatest player ever to play in both leagues... what he has done is really to create a lot of attention on Japan. "He is just such a great player, who carries himself with a lot of class and a lot of cool factor. I think that sets him apart," Small added.